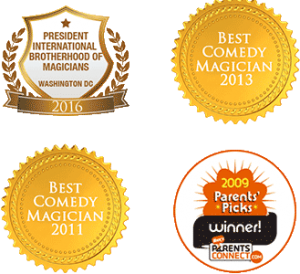 If you’re looking for a great way to dress up a kid’s party, you might want to consider a birthday party magician. These performers are a great touch to any party and can ensure that all the kids and grownups alike have a good time. Consider why they’re still a classic act and why so many kids love having magicians at their party today. They can entertain a crowd. A good birthday party magician will be able to entertain a crowd of children. This is unlike many kid’s games where children start to get bored once they lose the game or need to sit out, or with activities like arts and crafts where children may not like participating if they’re not very good at it. A good magician will provide entertainment for all kids no matter their ages. If you’re having a party for the kids and you know you’ll have ones in attendance that are both younger and older, this can be a great way to keep them all occupied. The little ones won’t get bored and the older ones will have something to get them off their smart phones! Kids typically enjoy activities more if they’re interactive, rather than simply sitting and watching a video or reading a comic book. A magician will get the kids involved with everything they do and will keep them involved throughout the entire show. Rather than facing a room full of bored children when you have a party, you know that a birthday party magician will ensure they engage their full attention. Trying to keep kids entertained through a birthday party or other event can be complicated; you might want to rent a bounce house for them to play in but this involves space needed outside, cords for power, a mess of shoes the kids need to take off, and of course the possibility that one of the smaller children will be hurt. When you hire a birthday party magician it’s simple entertainment that doesn’t require a lot of space, power cord, or anything special. A magician can typically set up a small table and that’s the only prop or space they need to entertain. You don’t need to feel overwhelmed with how to keep the kids happy when you hire a magician, and you can relax and enjoy the show yourself!